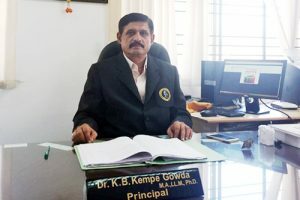 Dr K B Kempe Gowda M.A., LL.M., Ph.D.
Vivekananda College of Law established by the Janatha Education Society, was started in the year 1983 with three year LL.B. Course & Five year LL.B. Course when it was first introduced by Bangalore University in the year 1986 & it was started in our college in the very same year. It is the bounden duty of every citizen to know the law. Ignorance of law is no excuse. Our goal is to motivate as many people as possible to realise the importance of law and learn it, which will help them to deal effectively with their day-to-day transactions. Legal profession offers immense scope in not only tackling legal problems through judicial settlements but also to resort to alternate dispute resolutions systems. To contribute to the economy of the country, corporate sector solicits legal advice and in the present scenario where the world is reduced to a global village, sound legal education will enable us to hold steadfast our status in competing and catering to international standards in the era of globalization and liberalization. The college imparts legal education not only by its classroom lectures, but also by exposing its students to various activities, such as moot-courts, legal aid camps, and legal literacy programmes. The college has produced several rank-holders and continues to carry forwards its noble endeavor of spreading legal education. 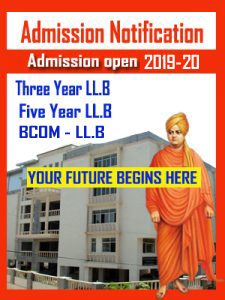 The college has well stacked library, e-library and moot court hall with competent full time and visiting faculty to prepare students in the competitive field of legal education. It gives me immense joy to congratulate Mr. K Jayaganesh of 3 Year LL.B for securing X Rank in KSLU Examinations 2016 and being the outstanding student of the college. I look forward to receive students from different disciplines to enrich the realm of Law.